During the War of 1812, many French Canadians fought under the command of Charles-Michel d’Irumberry de Salaberry in the Canadian Voltigeurs, a light infantry unit. The Voltigeurs’ main battle exploit was the Battle of the Châteauguay, which was fought on October 26, 1813, when some 1,700 Canadians helped drive back more than 3,000 Americans, preventing a major attack on Montréal. Library and Archives Canada has many documents on military service, including documents related to the War of 1812. Drafted mainly in English, these include muster rolls and paylists, along with land claims and petitions scattered throughout the collection. However, there are no military service files for specific individuals, unlike what is available for the First World War. The starting point for your research is to find a contract of service, which all Lower Canada militiamen had to sign before a notary. This was the case for Joseph Auclair (1794-1861), who took part in the Capture of Detroit and in the Battle of the Châteauguay. This document provides physical details and the name of the regiment and of the commanding officer. The Notarial Records blog article explains how to find this key document. 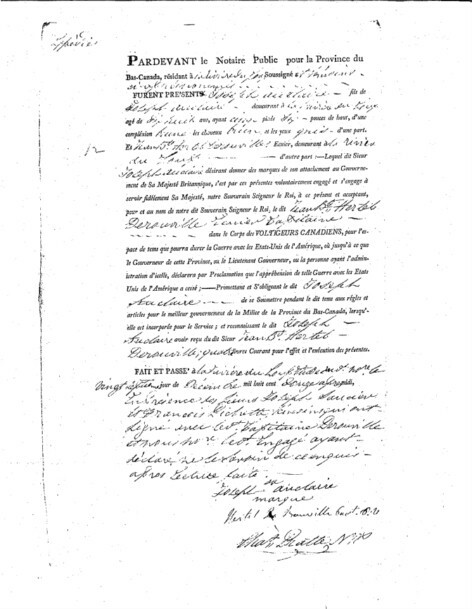 Certificate of enlistment of Joseph Auclair by Jean-Baptiste-René Hertel de Rouville, captain, Canadian Voltigeurs unit, drafted before the notary Charles Pratte, December 27, 1812, Bibliothèque et Archives nationales du Québec. You can also find references to medals awarded to veterans of the War of 1812 in our Medals, Honours and Awards database. With a bit of patience, you will be able to locate the name of your ancestor on paylists, also called Nominal Rolls and Paylists. Many militiamen were also granted land. These grants, announced in The Quebec Gazette, were confirmed by land patents, which can be found in our Lower Canada Land Petitions database. Lastly, to save you time, it is very important to read the search help pages carefully to find out how documents are organized. This entry was posted in Genealogy & Family History, Military Heritage, Our Collection and Facilities and tagged ancestors, Battle of the Châteauguay, Genealogy, Joseph Auclair, Medals Honours and Awards, Military, Nominal Rolls and Paylists, Notarial Records, War of 1812 by Library and Archives Canada Blog. Bookmark the permalink.